Hi crafters! I am back with a family traditional gift idea perfect for the holidays. Each year at Thanksgiving each member of our family would write down on a piece paper: your thoughts of the year, things you thankful for etc... So this year I decided to make it actually more special instead of our sual hand torn piece of paper we normally would do. So I went to Target and found these clear pails for a dollar and decided this would be perfect for what I was thinking. 1. 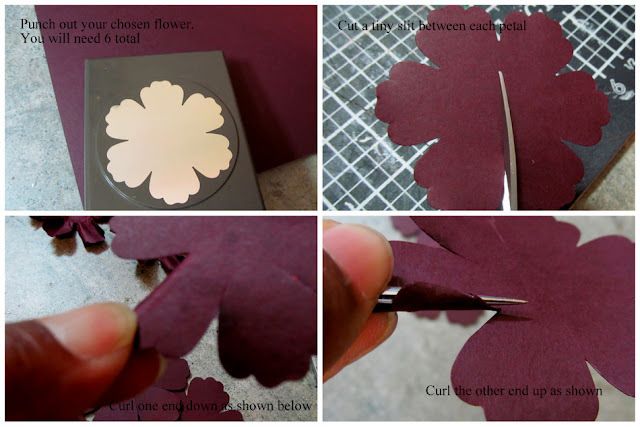 I punched out some flowers with a punch I had using the Cabernet Burgundy paper from the Flavours Gourmet paper pack from CutCardStock. I then took my Glue Dots Mini Dot n Go and adhere each layer of the flowers together making sure to stagger each one. I must say this truly is the best paper to use for flowers because of its ability to withstand water, mist etc... without it ripping most papers tend to start ripping when you are spraying them with water, but this make molding flowers so easy so I really look to use a very durable paper. Next you want to create some journal tags for inside of the pail. I cut each tag 3x6 stamped lines as shown below and a header for each one. Piece everything together and adhere it to the front of the pail and pop in your tags and you have a gorgeous centerpiece for the Holidays even!! I hope everyone has enjoed my post and thanks so much for stopping by! Awesome project for Thanksgiving. Would work well for weddings and anniversaries too.